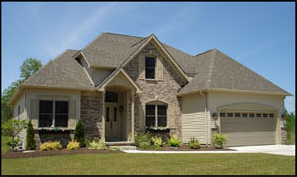 Natale Builders understands the importance of building a home from the inside out including insulation and air sealing. Natale Builders understands the importance of building a home from the inside out. The insulation and air sealing of your home are features that other builders don’t talk about. 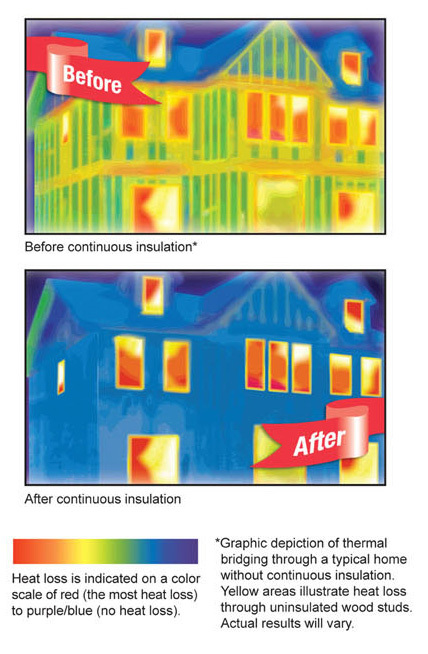 Natale understands continuous that insulation is the most effective way to keep your family comfortable. The ‘Before’ photo to the right shows a typical home built with traditional methods. The ‘After’ photo illustrates a Energy Star/ Green Natale home. If a picture is worth 1000 words, this is a great story. Learn more about our Rivera Greens properties. New York State: will provide a 25% income tax credit up to $5,000 that can be used until fulfilled. Excess credit may be carried forward for five years. Federal: government will provide a 30% tax credit, uncapped, on any system regardless of size and not exclusive to main residences. This offer expires in 2016 but excess credits may be carried to the following five years after purchase. Natale is using this technology today - see our home in Waterford going up right now using a solar shingle roof. Note: NYSERDA funding is subject to change. Financing short term: 12 months interest free financing will allow the owner of the solar system to wait until tax time when their tax credits are received to pay one lump sum. Financing long term: Ranges anywhere from 5 -10 years, interest rates start at 5.99% and can go up to 19.99%, please ask someone at CIR for a more specific breakdown. Purchase Outright: This is by far the most attractive return on investment, especially if you borrow to finance the system. Generally, the savings generated will be much larger than the cost of the money borrowed. 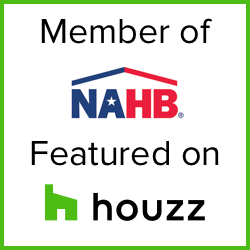 Purchasing a system also qualifies for all rebates, tax credits, and revenue from Solar Renewable Energy Credit (SREC) sales, while it also significantly increases your home in property value. As a general rule, every $1 saved in electricity costs / year translates to an increase of $20 in the property’s value. Leasing: Solar leasing eliminates the hassles sometimes associated with owning a home solar system. When you choose to lease solar, the leasing company is the actual owner of the solar system and equipment, but you are able to reap the energy benefits. You pay a low monthly lease payment and, in turn, receive clean, affordable energy without the upfront costs. Peace of mind comes with our maintenance and monitoring. Plus, you will have a Performance Guarantee. If for some reason your solar system does not produce the anticipated power, we will pay you the difference. Better yet, if your system produces more than anticipated, the power is yours to keep at no extra charge. Power Purchase Agreement (PPA): A PPA is very simple to lease and includes system monitoring, maintenance and a fixed amount for energy. The difference is the amount you pay will vary month-to-month depending on your system’s production. But how does it work? Every time an active solar system produces more energy than a house or business consumes, the owner receives Solar Renewable Energy Credit (SRECs) from their utility company. SRECs are commonly referred to as just “energy credits.” So, on a day when the owner’s system produces more than their electrical consumption, the meter on their house or business spins backwards (net metering), and they gain “energy credits.” These credits roll-over from month to month and can add up to a decent buck by the end of the year. 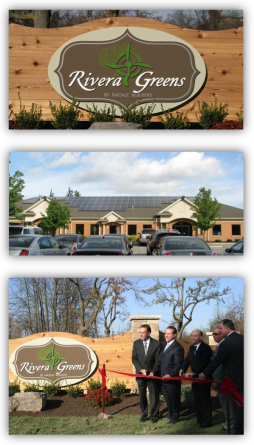 About us: As an electrical contractor since 1976, CIR has been able to create substantial positive change on the Western New York region with regard to energy efficiency by reducing consumption, which benefits both the environment and the local economy. To accomplish this we strive to continuously educate our employees and keep abreast of the latest technologies for increased energy efficiency and on-site energy generation. We will also pursue partnerships with industry organizations and local businesses that can help us to provide additional energy saving related services to our customers. Furthermore, we will keep our customers informed of the latest energy-related technologies, practices and issues to enable them to make more sustainable energy-related choices.